You’re A Bumby….Just Not As Cool. 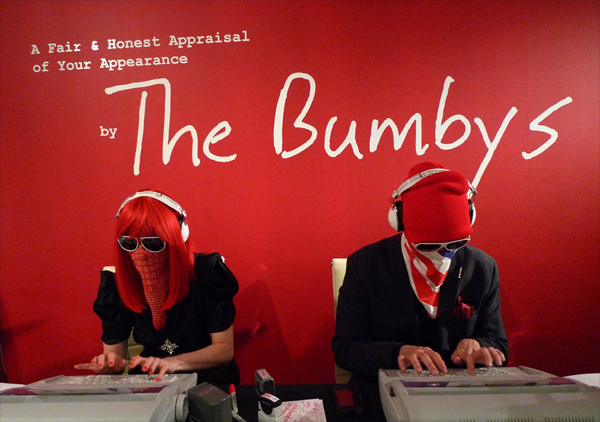 A masked and mute hip duo traveling the party circuit with their typewriters giving brave patrons a “fair and honest appraisal of their appearance”. You wait in a line until it’s your turn, you stand there awkwardly while a disguised person looks you up and down and then starts typing like a mad person. I gotta tell ya, I just love, love, this. It’s a prime example of someone taking something that already exists and tweaking it until it becomes creative money making genius. We are all pretty much Bumby’s on a daily basis, aren’t we? Making our snap judgement of people with just a glance. Although, in the Bumby’s case, they keep their poetic appraisals on a positive note and…they are completely fly. Check The Bumby’s out in action. Cool, good karma and a check…sign me up for a franchise.